(1) The massive diversity of nerve and muscle disease. (2) Stepwise approach to neuropathy. (3) Stepwise approach to myopathy. (4) Critical illness polyneuropathy and myopathy. (5) The workup of nerve and muscle disease. (6) Immunotherapy in nerve and muscle disease. Any discussion about nerve and muscle disease must in actuality represent only an attempt to cover as much ground as possible with regards to neuropathy (damage or disease affecting nerves), neuromuscular junction disease (failure of correct conduction through the junctions between nerve and muscle), and myopathy (damage or disease affecting muscles). The reason for this is that the list of conditions that fall under the category of nerve and muscle disease is ridiculously extensive. There are literally thousands of different kinds of nerve and muscle disease, but we will concentrate upon the most common and treatable conditions. - Guillain-Barre syndrome is an acute polyneuropathy resulting from the unintentional targeting of neuron gangliosides through molecular mimicry (the existence of sequences on a foreign invader that look similar to antigens on certain cells in the body). - The clinical severity peaks within one to four weeks of onset (usually around two weeks). - There are several subtypes. (a) Acute inflammatory demyelinating polyneuropathy (AIDP). - AIDP comprises 90-95% of Guillain-Barre cases in the west and is the most common subtype (Winer, 2008). - Involves immune attack against Schwann cells and resulting demyelination. - Patients usually present with ascending symmetrical weakness (legs first), sensory loss (usually proprioception, and usually mild), pain in the weakened muscles, and autonomic dysfunction. - Timing affects the nerve conduction studies. By the end of the first week, 25% of patients will satisfy the criteria for demyelination. By the end of the third week, 75% will satisfy the criteria for demyelination (Gorson et al, 2000). The sural nerves are usually "spared" (Winer, 2008). Unobtainable F-waves may be seen in Guillain-Barre syndrome with normal routine studies, suggesting conduction failure at the spinal root level. - Cerebrospinal fluid protein may be normal in the first week but becomes elevated without accompanying pleocytosis in 80-90% of patients by two to three weeks (Andary et al, 2014). The protein level remains normal in 10% of patients (Andary et al, 2014). (b) Acute motor axonal neuropathy (AMAN) and acute motor sensory axonal neuropathy (AMSAN). - Together, AMAN and AMSAN comprise 5% of Guillain-Barre cases in the west, but 30-65% of cases in Asia and South America. - Involve attack against the nodes of Ranvier with resulting axonal loss. - Symptoms develop more rapidly and with an earlier peak than in AIDP, and the reflexes are preserved or exaggerated (Kuwabara and Yuki, 2013). - Anti-GM1 antibodies may be positive. - Miller Fisher syndrome comprises up to 5% of Guillain-Barre cases. - Patients present with descending weakness (eyes first) and the triad of ophthalmoplegia, ataxia, and areflexia. - Anti-GQ1b antibodies are 90% sensitive. - Bickerstaff's brainstem encephalitis is extremely rare. - It involves large, irregular hyperintense lesions in the brainstem, and often a neuropathy as well. - Patients present with ophthalmoplegia, hyperreflexia, and reduced awareness or coma. - Anti-GQ1b antibodies are 66% sensitive (Odaka et al, 2003). - Diabetic neuropathies may include a component of inflammatory demyelination resembling CIDP (Siao et al, 2011). - The most common presentation is a chronic symmetrical distal neuropathy with autonomic involvement. Ankle jerks are virtually always absent and knee jerks are absent in most cases. Autonomic testing is abnormal in 97% of cases but autonomic symptoms are rare (Llewelyn, 2003). - The second most common presentation is an acute to subacute proximal neuropathy also known as diabetic amyotrophy. Initially there is unilateral pain followed by unilateral weakness, but this often becomes asymmetrically bilateral (Llewelyn, 2003). - There are also acute focal neuropathies such as a 3rd nerve palsy that spares the pupil and a 6th nerve palsy. However, other nerves can also be involved (facial, trochlear, ulnar, median, radial, lateral femoral cutaneous, sciatic, peroneal, etc). - Lastly, both mononeuritis multiplex and thoracoabdominal radiculopathy are possible. - Vasculitic neuropathy involves the inflammatory occlusion of arterioles, resulting in ischemia and infarction of peripheral nerves. - Patients usually present with a systemic vasculitis as well (Gorson, 2007). In 60% of patients, the neuropathy presents as a mononeuritis multiplex. In roughly 25% of patients, the neuropathy presents as a distal symmetric polyneuropathy. Overall, the neuropathy is painful in 80% of patients. - Diagnosis is clinical with supportive nerve conduction studies, a vasculitic screen, and a biopsy. If a mononeuritis multiplex is clinically and electrophysiologically present along with systemic signs of vasculitis and a supportive vasculitic screen, biopsy may not be needed, but generally a combined nerve and muscle biopsy is the gold standard in the diagnosis (Collins et al, 2000). Lumbar puncture is usually normal. (4) Chronic inflammatory demyelinating polyneuropathy (CIDP). - CIDP is the chronic counterpart to AIDP, and presumably also has an immune origin. - Patients usually present with symmetrical proximal weakness. By definition, the symptoms continue to evolve for more than eight weeks (Vallat et al, 2010). - Diagnosis is clinical with nerve conduction studies and lumbar puncture. Nerve conduction studies satisfy the criteria for demyelination (notably with the presence of conduction blocks). Lumbar puncture reveals a significantly elevated cerebrospinal fluid protein level in 80% of patients and there may also be a mild lymphocytic pleocytosis of >50 cells (Lewis et al, 2013). A sural nerve biopsy is no longer considered routine (Molenaar et al, 1998) but may be considered if a vasculitic neuropathy cannot be ruled out. - Multifocal motor neuropathy is a purely motor mononeuritis multiplex characterized by multifocal partial conduction blocks (Nobile-Orazio and Gallia, 2013). There is also a monofocal variant. - Patients present with a small degree of wasting that is out of proportion to the more profound asymmetric weakness. The arms are weaker than the legs, particularly the finger extensors (Talbot, 2002). - Diagnosis is based on nerve conduction studies showing persistent, multifocal, partial conduction block and other demyelinating features in motor nerves. - Charcot-Marie-Tooth is a hereditary motor and sensory neuropathy. - Patients present at an early age with foot drop, hammer toe, or stork leg. There may be pes cavus (high arched feet) or pes planus (flat arched feet). There may be sensation loss in the legs and feet. - Diagnosis is based on nerve conduction studies showing uniform slowing of conduction velocities. - Motor neuron disease consists of anterior horn cell degeneration in the spinal cord, motor nuclei of the lower brainstem cranial nerves, and corticospinal and corticobulbar pathways. - Patients present with either progressive bulbar palsy (lower motor neuron brainstem), pseudobulbar palsy (upper motor neuron brainstem), spinal muscular atrophy (lower motor neuron limbs), primary lateral sclerosis (upper motor neuron limbs), or amyotrophic lateral sclerosis (mixed lower and upper motor neuron brainstem and/or limbs). - Diagnosis is based on presence of upper and lower motor neuron sings in at least three of the bulbar, cervical, thoracic, and lumbar regions. - Myasthenia gravis is from antibodies to the skeletal muscle nicotinic acetylcholine receptor or the muscle-specific receptor tyrosine kinase (MuSK). - Patients present with fluctuating weakness and easy fatiguability of voluntary muscles. They may also have ptosis, diplopia, difficulty chewing or swallowing, nasal speech, respiratory difficulties, or limb weakness. On examination there may be increased ptosis with sustained vertical upgaze, weakness of shoulder abduction, and a reduced single breath test (count to ten means 1 L FVC). The icepack test is useful if there is ptosis. - Diagnosis is based on single fiber EMG and antibodies to the ACh receptor and MuSK. The former is 100% sensitive, the latter are 100% specific. - Polymyositis is an immune-mediated inflammatory myopathy. ​- Patients present with symmetric weakness, wasting, and myalgia, especially of the proximal limb and girdle muscles. There may be interstitial pulmonary disease, malignancy, dysphagia, Raynaud's, arthralgia, malaise, weight loss, and low-grade fever. - Diagnosis is based on serum CK (may be normal), antinuclear antibodies, and EMG showing myopathy with increased membrane irritability. Muscle biopsy may be needed. - Dermatomyositis is a microangiopathy affecting skin and muscle. - Patients present with muscle weakness but may also have a heliotrope rash (erythematous rash about the eyes) or Gottron sign (over the extensor surfaces of the joints). There may also be fingernail or scalp lesions. There may be interstitial pulmonary disease, malignancy, dysphagia, Raynaud's, arthralgia, malaise, weight loss, and low-grade fever. - Inclusion body myositis is an inflammatory or degenerative muscle disease. - Patients present usually over 50 years of age with weakness of quadriceps followed by forearm flexors. There may be muscle pain. Dysphagia is common. - Diagnosis is based on serum CK (often normal or only mildly increased) and an EMG revealing neurogenic units with or without myopathic units. MRI of the quadriceps or forearm may show selective atrophy of quadriceps and forearm flexors. Muscle biopsy may be needed. - Myotonic dystrophy is a dominantly inherited disorder manifest in the third or fourth decade. - Patients present with one of two forms. In DM1 there is weakness and wasting of facial, sternocleidomastoid, and distal limb muscles. There may be cataracts, frontal baldness, testicular atrophy, diabetes mellitus, cardiac abnormalities, respiratory disturbances, intellectual and behaviour changes, and sudden death. In DM2 the course is less severe and it is primarily proximal weakness. - Diagnosis is based on clinical suspicion, EMG showing myopathic changes and myotonic discharges, and genetic testing for DM1 and DM2. Neuropathies can be clinically classified by their temporal progression and spatial pattern into acute symmetrical, mononeuritis multiplex, and chronic symmetrical neuropathies. Nerve conduction studies can then be performed to electrophysiologically classify them into demyelinating and axonal neuropathies (Hughes, 2002; Willison and Winer, 2003). (1) Acute symmetrical (<4 weeks). - The AIDP subtype of Guillain-Barre syndrome is the most common and only demyelinating acute symmetrical neuropathy. - An asymmetric, asynchronous sensorimotor neuropathy with damage to at least two different nerve areas; most of the mononeuritis multiplexes are axonal. (3) Chronic symmetrical (>3 months). - Most chronic symmetrical neuropathies are axonal, but many of the demyelinating ones are highly treatable. 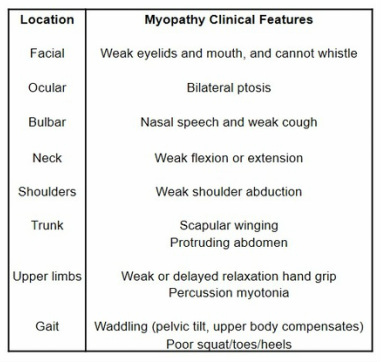 - Myopathies are much harder to classify clinically. - Adult-onset myopathies are classified into acquired and hereditary myopathies (Bleecker, 2005; Chawla, 2011; Emery, 2002). - Many of these are treatable. - Some of these are treatable. Critically ill ICU patients may develop weakness from any of the following (use the MUSCLES acronym). Medications - steroids, pancuronium, vercuronium. Undiagnosed neuromuscular disorder - Guillain Barre, diabetes, ALS, myasthenia gravis, Lambert Eaton, muscular dystrophy. Spinal cord damage - ischemic, compressive hematoma, trauma. Critical illness - polyneuropathy, myopathy, polyneuromyopathy. Loss of muscle mass - disuse atrophy, rhabdomyolysis. Electrolyte disorder - hypokalemia, hypophosphatemia, hypermagnesemia. Systemic illness - acute porphyria, vasculitic neuropathy, endocrine myopathy. It is important to perform nerve conduction studies, EMG, and repetitive nerve stimulations on all such patients. To differentiate polyneuropathy, myopathy, and polyneuromyopathy think along the subsequent lines. In critical illness polyneuropathy, one looks for the following. Nerve conduction studies - reduced SNAP and CMAP amplitudes. EMG - spontaneous activity, reduced recruitment, and normal MUAP morphology. In critical illness myopathy, one looks for the following. Nerve conduction studies - normal SNAP but reduced CMAP amplitudes. EMG - no spontaneous activity, early recruitment, and short duration MUAP morphology. Lumbar puncture (protein and cell count). Consider anti-ganglioside antibodies, anti-Hu antibodies, ANA/ENA/ANCA, HIV, and urinary porphyrins and porphobilinogen. Lumbar puncture (protein and white cell count). Vasculitic screen (ANA/ENA/ANCA, complement, HIV, Hep B surface antigen, Hep C antibody, and cryoglobulins). Consider anti-Hu antibodies, anti-ganglioside antibodies, or PMP22 gene deletion. Consider combined nerve and muscle biopsy. FBC, electrolytes, Cr, LFTs, TSH, and CRP. ANA, ENA, RF, and HIV. Vitamins B12, folate, and E.
Serum protein electrophoresis, serum Igs, and urinalysis for BJP. Consider anti-GM1 and anti-Hu antibodies. Consider anti-ganglioside antibodies, PMP-22 gene duplication, anti-MAG antibodies, serum protein electrophoresis, serum Igs, and urinalysis for BJP. Nerve conduction studies and EMG. FBC, electrolytes, Cr, LFTs, TSH, B12, serum protein electrophoresis, serum Igs, anti-GM1 antibodies, anti-MAG antibodies, and HIV. MRI brain and spine with gadolinium. Nerve conduction studies, EMG, repetitive nerve stimulation, and single fiber EMG. Anti-AChR, anti-MuSK, and anti-SM antibodies. Anti-GQ1b antibodies if considering Miller-Fisher syndrome. Anti-VGCC antibodies if considering Lambert-Eaton syndrome. FBC, electrolytes, Cr, LFTs, TSH, PTH, CRP, ANA, RF, HIV, lactate, pyruvate, ammonia, carnitine, anti-Jo1 antibodies, anti-Mi2 antibodies, and anti-Hu antibodies. Urinalysis for myoglobinuria and carnitine. Urinary free cortisol over 24 hours. The treatment effectiveness in nerve and muscle disease varies wildly, from conditions with virtually no treatment to conditions that can be essentially cured by forcing them into permanent remission with immunotherapy. The ideal immunotherapy depends on the condition it is used for and relevant possible side-effects to the patient. - Monitor with telemetry and FVCs every six hours (if FVC<1 L, intubate). Initiate intravenous immunoglobulin (IVIg) 2 g/kg over five days. - Neuropathic pain relief, improved serum glucose control, and physiotherapy. - Initiate prednisolone 1 mg/kg daily. Taper down prednisolone after three months to alternate daily. - If the neuropathy is severe, add cyclophosphamide 100-150 mg daily. Continue the combination of prednisolone and cyclophosphamide for at least six months. - For mild to moderate neuropathies, initiate prednisolone 1 mg/kg daily and any of azathioprine 1-1.5 mg/kg bd (for a total of 2-3 mg/kg daily), mycophenolate 1 g bd, cyclosporine 100-150 mg bd, or methotrexate 10-20 mg weekly (provide folate 5 mg daily). The prednisolone should be tapered by 10 mg per week until a maintenance dose of 10 mg daily is achieved. If steroids are contraindicated, commence IVIg 2 g/kg over two to five days and continue maintenance infusions of 1 g/kg over one day every three to six weeks. - For severe neuropathies, commence methylprednisolone 1 g iv daily for three to five days and azathioprine, mycophenolate, cyclosporine, or methotrexate. 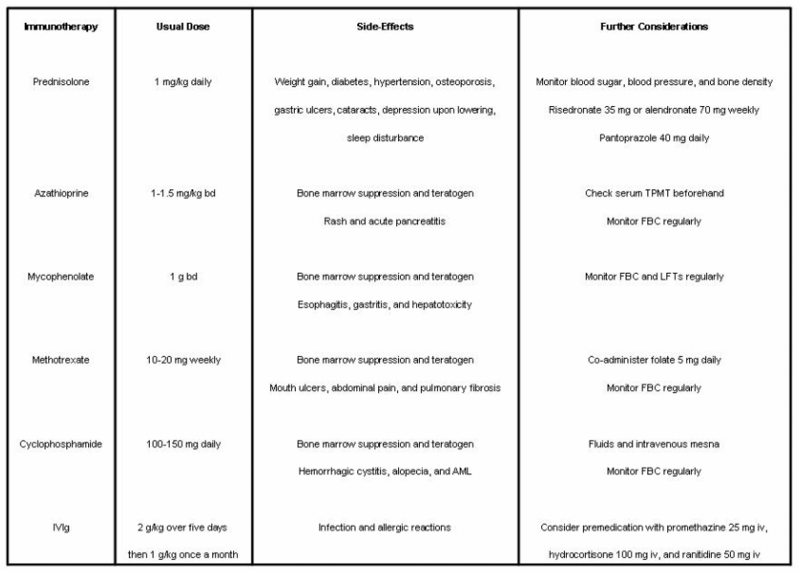 If steroids are contraindicated, commence IVIg 2 g/kg over five days and continue maintenance infusions of 1 g/kg (over 1 or 2 days) once every 3-6 weeks. - If the condition is refractory to the above regimes, commence rituximab 1 g iv twice within two weeks. - Monitor with a standard strength assessment protocol. - The use of IVIg 2 g/kg over five days results in rapid improvement in recently affected limb regions within one week. However, the effect wears off after several years. IVIg probably does not slow down secondary axonal loss (Nobile-Orazio and Gallia, 2013). - Alternative possibilities include subcutaneous immunoglobulin, rituximab, and fingolimod (Nobile-Orazio and Gallia, 2013). - Steroids do nothing and may be harmful. - Multidisciplinary assessment is the only treatment available. - Surgery may be helpful, particulary osteotomy (bone modification) in the foot, release (soft tissue modification) of tendons or the plantar fascia, or arthrodesis (joint stabilizing by fusion). - Initiate riluzole 50 mg bd to prolong survival by three to four months (Wood-Allum and Shaw, 2010). - Treat spasticity (baclofen 5 mg tds up to 30 mg tds, increase by 5 mg tds every three days), muscle cramps (either baclofen or gabapentin 300 mg nocte up to 900 mg tds), and sialorrhea (amitriptyline 10 mg nocte up to 50 mg nocte). ​- Increase water intake to avoid dehydration. - Monitor with swallowing assessments, lung function tests, and depression screens. - Refer early to a motor neuron disease multidisciplinary center. - Botox therapy can be useful for sialorrhea. Inject 10 units in each of four sites (find the line between the tragus and angle of the mouth, find third nearest the tragus, and inject 2 injections 1 cm above and 2 injections 1 cm below the line; you can also inject under the jaw; aim straight up.) per side. - For mild myasthenia, initiate pyridostigmine 60-120 mg tds and prednisolone 10-20 mg daily. Increase the prednisolone by 5 mg every week until clinical improvement or a maximum of 50 mg daily. When clinical improvement begins (after three to six months), slowly taper down the prednisolone by 5 mg alternate daily every two weeks to 50 mg alternate daily, then taper by 1-5 mg every two weeks. - For moderate to severe myasthenia, monitor with telemetry and forced vital capacities every six hours (if FVC<1 L, intubate). Initiate IVIg 2 g/kg over five days or methylprednisolone 1 g iv daily for three to five days. Upon completion, commence pyridostigmine 60-120 mg tds, prednisolone 1 mg/kg mg daily, and azathioprine (or mycophenolate, cyclosporine, or methotrexate). After at least six months, slowly taper down the prednisolone by 5 mg alternate daily every two weeks to 1 mg/kg mg alternate daily, then taper by 1-5 mg every two weeks. - For anti-acetylcholine receptor myasthenia gravis, perform a thymectomy for all patients with a thymoma, and for patients without a thymoma aged 10 to 55 years with generalized myasthenia. - For anti-MuSK myasthenia gravis, substitute IVIg with plasma exchange (PLEX) 4-6 exchanges on alternate days and do not necessarily use pyridostigmine or perform a thymectomy (Meriggioli and Sanders, 2009). - Initiate prednisolone 1 mg/kg and continue until the CK level returns to reference ranges (usually four to eight weeks). Taper by 5-10 mg per month until the lowest dose that controls the disease is reached. - Initiate prednisolone 0.5-2 mg/kg daily up to 60 mg daily, as well as azathioprine, mycophenolate, cyclosporine, or methotrexate. - If there is no response, commence IVIg 2 g/kg over five days and continue maintenance infusions of 1 g/kg once a month for six months. - Treatment is symptomatic. However, resistance training can be beneficial and instituted safely (Spector et al, 1997). - Management of falls should be maximized. - Treatment involves yearly ECG monitoring, fasting glucose, eye review, a sleep study if fatigue is an issue, resistance training, physiotherapy for ankle foot orthoses, occupational therapy for home modifications and safety assessment, and speech pathology for assessing aspiration and dysphagia risk (Turner and Hilton-Jones, 2010). Here is a synopsis of chronic symmetrical neuropathy treatment. If axonal, do the workup and remove the source. If demyelinating, do the workup but do not delay immune therapy if indicated. Treat neuropathic pain (amitriptyline 10 mg nocte up to 200 mg nocte, nortriptyline 10 mg nocte up to 100 mg nocte, gabapentin 300 mg nocte up to 900 mg tds, or pregabalin 75 mg nocte up to 300 mg bd). Treat autonomic neuropathy (fludrocortisone 0.1 mg daily up to 0.3 mg daily or midodrine 2.5 mg bd up to 15 mg bd). - Remove antihypertensives, antidepressants, and antipsychotics. - Maintain muscle (exercise, physiotherapy, and occupational therapy). - Maintain bone (bone density scan, calcium, vitamin D 2,000 units daily, and zolendronate infusion once a year). More often than not, it is essential to perform neurophysiology testing on any suspected nerve and muscle disease, as this alone will often determine whether it may potentially respond to treatment. The workup then guides the specific treatment. If a nerve and muscle disease is treatable, it can make all the difference between permanent disability and full recovery. Using Guillain-Barre syndrome as an example, 86% of treated patients will recover within six months, and 92% will recover within one year (Soysal et al, 2011). Without treatment, significantly fewer patients will recover at all, and those that do recover take longer to do so (Hughes et al, 2007). In the even more impressive example of myasthenia gravis, the mortality in treated patients is now 2-4% (Alshekhlee et al, 2009) with most patients having a normal lifespan. In comparison, patients treated with only acetylcholinesterase inhibitors up until the 1950s had a five-year mortality of 30-60% (Grob et al, 1987; Simon, 1935), an astounding ten to twenty-fold increase in mortality that was simply a fact of life prior to the use of steroids, IVIg, and steroid-sparing agents. Alshekhlee et al. 2009. Incidence and mortality rates of myasthenia gravis and myasthenic crisis in US hospitals. Neurology 72(18), 1548-1554. Andary et al. 2014. Guillain-Barre syndrome. Medscape. http://emedicine.medscape.com/article/315632-overview. Bleecker. 2005. How to approach the patient with muscular symptoms in the general neurological practice? Acta Neurologica Belgica 105, 18-22. Chawla. 2011. Stepwise approach to myopathy in systemic disease. Frontiers in Neurology 2(49), 1-27. Collins et al. 2000. Superficial peroneal nerve/peroneus brevis muscle biopsy in vasculitic neuropathy in vasculitic neuropathy. Neurology 55(5), 636-643. Emery. 2002. The muscular dystrophies. The Lancet 359(9307), 687-695. Gorson et al. 2002. Guillain-Barre syndrome and related disorders. Neuromuscular Disorders in Clinical Practice, Butterworth Heinemann, 544-566. Gorson. 2007. Vasculitic neuropathies: an update. The Neurologist 13(1), 12-19. Grob et al. 1987. The course of myasthenia gravis and therapies affecting outcome. Annals of the New York Academy of Sciences 505, 472-499. Hermanns et al. 2000. Peripheral neuropathy associated with hereditary and sporadic inclusion body myositis: confirmation by electron microscopy and morphometry. Journal of the Neurological Sciences 179(S1-2), 92-102. Hughes. 2002. Peripheral neuropathy. British Medical Journal 324, 466. Hughes et al. 2007. Immunotherapy for Guillain-Barre syndrome: a systematic review. Brain 130(9), 2245-2257. Jackson and Barohn. 2013. A pattern recognition approach to myopathy. Continuum 2013, 1674-1697. Kuwabara and Yuki. 2013. Axonal Guillain-Barre syndrome:concepts and controversies. The Lancet Neurology 12(12), 1180-1188. Lewis et al. 2013. Chronic inflammatory demyelinating polyradiculopathy. http://emedicine.medscape.com/article/1172965-overview. Llewelyn. 2003. The diabetic neuropathies: types, diagnosis, and management. Journal of Neurology, Neurosurgery, and Psychiatry 74, ii15-ii19. Meriggioli and Sanders. 2009. Autoimmune myasthenia gravis: emerging clinical and biological heterogeneity. Lancet Neurology 8(5), 475-490. Molenaar et al. 1998. Diagnostic value of sural nerve biopsy in chronic inflammatory demyelinating polyradiculopathy. Journal of Neurology, Neurosurgery, and Psychiatry 64, 84-89. Nobile-Orazio and Gallia. 2013. Multifocal motor neuropathy: current therapies and novel strategies. Drugs 73, 397-406. Odaka et al. 2003. Bickerstaff's brainstem encephalitis: clinical features of 62 cases and a subgroup associated with Guillain-Barre syndrome. Brain 126(10), 2279-2290. ​Siao et al. 2011. Practical Approach to Electromyography. Demos Medical, 1st edition. Simon. 1935. Myasthenia gravis: effect of treatment with anterior pituitary extract. The Journal of the American Medical Association 104, 2065-2066. Soysal et al. 2011. Clinico-electrophysiological findings and prognosis of Guillain-Barre syndrome - 10 years experience. Acta Neurologica Scandinavia 123(3), 181-186. Spector et al. 1997. Safety and efficacy of strength training in patients with sporadic inclusion body myositis. Muscle and Nerve 20(10), 1242-1248. Talbot. 2002. Motor neuron disease. Postgraduate Medical Journal 78, 513-519. Turner and Hilton-Jones. 2010. The myotonic dystrophies: diagnosis and management. Journal of Neurology, Neurosurgery, and Psychiatry 81, 358-367. Udd and Krahe. 2012. 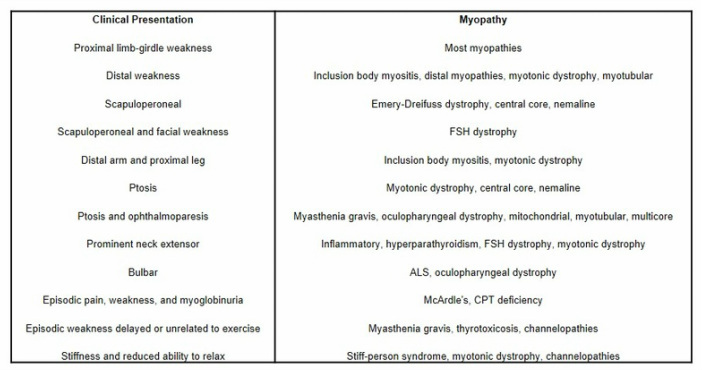 The myotonic dystrophies: molecular, clinical, and therapeutic challenges. The Lancet Neurology 11(10), 891-905. Vallat et al. 2010. Chronic inflammatory demyelinating polyradiculopathy: diagnostic and therapeutic challenges for a treatable condition. The Lancet Neurology 9(4), 402-412. WIllison and Winer. 2003. Clinical evaluation and investigation of neuropathy. Journal of Neurology, Neurosurgery, and Psychiatry 2003(74), ii3-ii8. Winer. 2008. Guillain-Barre syndrome. British Medical Journal 337, a671. Wood-Allum and Shaw. 2010. Motor neuron disease: a practical update on diagnosis and management. Clinical Medicine 10(3), 252-258.